The client wanted to embrace a collaborative approach to accelerate the delivery through an integrated processes and continuous delivery. Introduce the teams to function in sync without any delay in deployment and also have a transparent workflow of the process. They needed a change that moves away from siloed work streams while employing the right process and technologies. 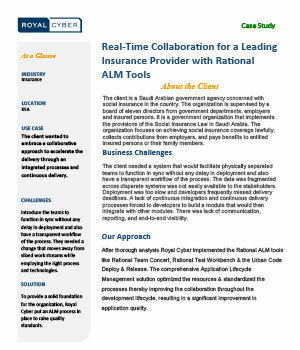 To provide a solid foundation for the organization, Royal Cyber put an ALM process in place to raise quality standards.